Summer can be the perfect time to enjoy outdoor activities or finish an outdoor DIY project around the home. However, the rising temperatures of the season can cause heat stress that leads to heat stroke, heat exhaustion or other illnesses. In order to keep you, your family and your co-workers safe, we are offering advice on how to reduce heat stress and prevent heat exhaustion and heat strokes. While heat stress can be dangerous for anyone, those older than 65 and those who have a history of heart disease or high blood pressure are at greater risk of heat stroke or exhaustion. If you or a loved one falls into this category, we encourage you to take extra precautions during outdoor physical activities. If you are planning outdoor activities or work, incorporate recovery times and rest breaks frequently into your time frame. If your project requires an extended time frame, schedule short intervals of light work, increasing the work gradually as the week goes on. This will help your body acclimate to the heat and can reduce your chances of suffering a heat-related illness. 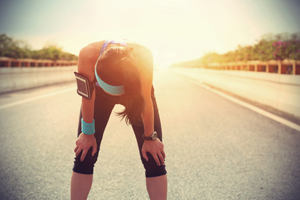 Avoid physical activity for long periods of time based on the heat index. If the temperature is above 103 degrees Fahrenheit, your chances of heat stroke or exhaustion increase from moderate to high. However, this rule of thumb does not take into account humidity. Humidity can add to heat stress, and can cause even lower temperatures to be potentially dangerous. Regardless of the heat index, be sure to have a supply of cool water available to you throughout the day. The CDC recommends drinking 8 ounces of water every 15 to 20 minutes during moderate to high physical activity in the heat, but no more than six glasses within an hour. If you are engaging in sustained physical activity for several hours, choose a sports drink with electrolytes for hydration. Always avoid alcoholic and caffeinated beverages while working in the heat. If possible, always have a partner or buddy around to assist you in your work and to monitor each other for symptoms of heat illness. Symptoms include dizziness, cramps, nausea, increased heart rate, headache, fainting and confusion. You can view a complete list of heat-related illnesses and their symptoms on the CDC’s website. If you do begin to experience symptoms of heat stroke or heat exhaustion, immediately stop your activity and try to get to a cooler place. Contact 911, because heat illnesses can be fatal. While waiting for emergency services, remove any unnecessary clothing and, if possible, place yourself in an ice bath or soak clothes in cool water. Take frequent sips of cool water if experiencing heat exhaustion.